The U.S. 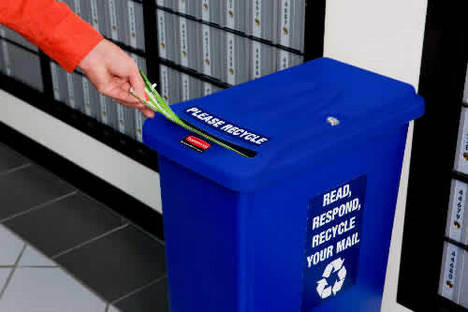 Postal Service wants you to know about a new, cheery feature: More recycling opportunities at its offices. Uh huh. Since people go there so often. This stinks of an antiquated government agency grasping at straws to stay alive. Every time I turn around they raise the prices of stamps. Hint: Because people don’t use the mail as much anymore. E-mail, social networking, cell phones, have replaced the need for shipping paper across long distances. As CNN reports, the Postal Service projects a $7 billion deficit next fiscal year. Last year, the amount of mail sent declined 12.7%. My point: We don’t need more recycling bins at post offices. We need fewer post offices, or no postal service at all. If the U.S. Postal Service wanted to help the environment, it would take more of its trucks off the road and keep less offices cooled, heated, electrified. I don’t want to put people out of work, but I also don’t think it’s wise to keep funding this dying beast. I used to work at a newspaper, fer God sakes. If I want to receive or send mail let me contract with a service like UPS or FedEx. They’re going to be in my neighborhood sooner or later anyway. Maybe not every day, but I can live with that. Most mail I receive from the USPS is junk mail, which goes straight to the recycle bin. The important mail that I need to receive can in most cases be delivered electronically. If I must have the mail delivered in paper form, I can pay for it. I don’t have all the answers, but I tell you what, my pay-as-you-go mail bill would be very small. It drags on from there. I agree with this for the most part but I sell a lot of stuff on eBay that I wouldn’t be able to be competitive with if it weren’t for the relatively low rates for certain classes of items with priority mail/first class. So that leaves me torn. I do my best to reuse boxes to cut down on waste and use lighter, recyclable packing supplies, but I simply cannot afford to use UPS/Fed Ex because I’m not high enough volume to get a decent discount.